Le Château des Marais luxury camping site is strategically surrounded by numerous sumptuous castle-style Châteaux. Set against a backdrop of the luxurious and lush Loire valley, the site has been tastefully designed to encompass the foundations of a regal and rural manor house. With the royal palace of Château de Chambord just three miles away, this holiday hideaway is perfect for families who wish to flavour some French opulence as well as tune into the tranquil atmosphere. To select your choice of mobile home accommodation, get in touch with LUX-camp today. What is special about a Le Château des Marais camping holiday? Offers a traditional and authentic French holiday experience. Surrounded by 70 castle sites. Swimming complex with five pools. Close proximity to a river, a lake and stunning landscape views.Choices of water themes - lake, lagoon and river You are almost guaranteed good weather in this sunny region, and what better way to make use of it than to go swimming? 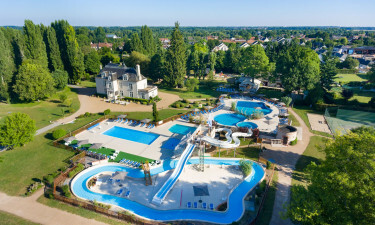 Le Château des Marais is all about luxury camping and offers guests a variety of ways to while away the hours. The kids will absolutely adore the five pools, especially the lazy river feature. There are water slides, a special water chute and smaller paddling pools for toddlers to play in. As if that were not enough water fun, there are a lake and river just a kilometre away. Now that you have the children sorted, how about a little pampering for Mum and Dad? Le Château des Marais provides a wonderful spa and relaxation area with a variety of treats to make your holiday special too. Choose from massage, manicure and pedicure favourites. Try out the steam room, sauna and Jacuzzi - or allow yourself the luxury of a facial. There is a range of other full-body beauty therapies including the traditional Balneo treatments. If you are a more active type, there is a vast amount of physical activities for you to engage in. When not enjoying your luxury tent or mobile home, the surrounding Chambord countryside is home to several sumptuous castles, with their opulent grounds and well-maintained structures. Among these is the splendiferous Château de Chambord, renowned for its sheer opulence. It is the largest of the châteaux in the lovely, Loire valley and should be first on your list of places to visit. This grandiose site has a staggering 22 miles of stone walls, and dominates the 12,00 acres of land around it. It is rumoured that Leonardo Da Vinci was responsible for some of the delectable design. 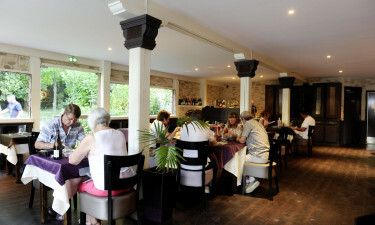 Le Château des Marais holiday camping site comes complete with a resident, terraced restaurant, take-away and bar. They run alongside each other so you can conveniently eat, drink and be merry. There is also a small supermarket onsite, which is well stocked with all your camping necessities.